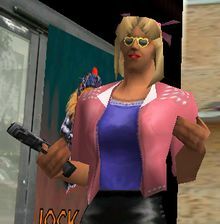 The Psycho is a minor character in Grand Theft Auto: Vice City, voiced by Hunter Platin. He has an obsession of killing the four members of the band Love Fist, and dresses up as a woman to get near the band. He attempts to kill Love Fist, but is himself apparently killed by Tommy Vercetti. However, it turns out he survived as the members of Love Fist tells Tommy that "that Psycho's back!". He plants Boomshine based explosives in the Love Fist limousine, with Tommy driving around Vice City whilst guiding the band members on how to defuse the bomb which they manage to do successfully. Following this, The Psycho is never seen or heard from again. The Psycho looks like the killer in the 1980 film staring Michael Caine titled Dressed to Kill, in which the male killer dresses like a woman to murder other men. This page was last modified on 9 June 2012, at 13:56.